Elevation data are essential to a broad range of applications, including forest resources management, wildlife and habitat management, national security, recreation, and many others. For the State of Hawaii, elevation data are critical for infrastructure and construction management, flood risk management, geologic resource assessment and hazard mitigation, natural resources conservation, coastal zone management, and other business uses. Today, high-density light detection and ranging (lidar) data are the primary sources for deriving elevation models and other datasets. Federal, State, Tribal, U.S. territorial, and local agencies work in partnership to (1) replace data that are older and of lower quality and (2) provide coverage where publicly accessible data do not exist. A joint goal of State and Federal partners is to acquire consistent, statewide coverage to support existing and emerging applications enabled by lidar data. The National Enhanced Elevation Assessment evaluated multiple elevation data acquisition options to determine the optimal data quality and data replacement cycle relative to cost to meet the identified requirements of the user community. The evaluation demonstrated that lidar acquisition at quality level 2 for the conterminous United States, Hawaii, and selected U.S. territories, and quality level 5 interferometric synthetic aperture radar(IfSAR) data for Alaska, all with a 6- to 10-year acquisition cycle, provided the highest benefit/cost ratios. The 3D Elevation Program (3DEP) initiative selected an 8-year acquisition cycle for the respective quality levels. 3DEP, managed by the U.S. Geological Survey, the Office of Management and Budget Circular A–16 lead agency for terrestrial elevation data, responds to the growing need for high-quality topographic data and a wide range of other three-dimensional (3D) representations of the Nation’s natural and constructed features. 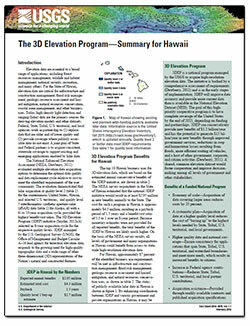 Carswell, W.J., Jr., 2016, The 3D Elevation Program—Summary for Hawaii (ver. 1.1, February 2016): U.S. Geological Survey Fact Sheet 2014–3079, 2 p., https://dx.doi.org/10.3133/fs20143079.